Phnom Penh, the capital of Cambodia and once known as the "Pearl of Asia"
Phnom Penh is on the up. If you want a sense of Cambodia’s future, then visit its capital. With young people pouring out of its universities, a blossoming start-up scene, and new cafes, bars and restaurants opening every week, it’s an obviously growing city – economically and socially. Once known as “the Pearl of Asia” it’s also a city riddled with politics, history and charm, and those who have a few days to spend there will be rewarded with a better understanding of Cambodia as a whole. Phnom Penh is located where the two great rivers in Cambodia – the Tonle Sap and the Mekong – meet. The area was the capital of Cambodia for a period of about 70 years in the 15th century, but it was the French influence in 19th century that firmly established Phnom Penh not only as a political hub, but as a vibrant city with modern infrastructure and of course French-colonial architecture. The city is now home to over 2 million people – just under 15% of the population of Cambodia. Cambodia’s very own stock exchange was incorporated in 2010 and the capital is a base for the headquarters of most of the (multitudinous) NGOs that operate in the country. 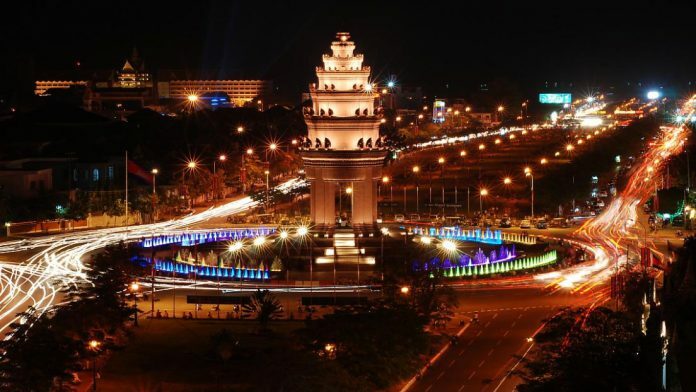 Over the last few years Phnom Penh has grown at a rapid rate with a huge amount of international investment giving rise to shopping malls, office buildings and entertainment complexes. One of the most popular areas of Phnom Penh for visitors tends to be the Riverside. Lined with bars and restaurants, and giving nice views of the Tonle Sap, this area lends itself to lazy afternoons watching the world go by. A short distance east of the river, the streets are also packed with late night bars and guesthouses as well as being close to the central market and night market. For those wanting to stray away from the usual tourist hotspots, head to street 240, or the area just south (and slightly south east) of Independence monument. 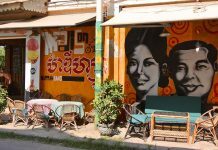 These up-market areas demonstrate Phnom Penh’s blossoming café culture. Over the last few years a plethora of coffee shops have sprung up – used by Cambodians and expats alike. Sipping coffee and sampling pastries in one of these establishments is a great way to get a bit of a feel for the new emerging side of Phnom Penh – a young, rising, ambitious population pursuing both education and business in a bid to compete with other ASEAN nations. The tourist “sights” in Phnom Penh are rather sobering as some of the most visited places are Tuol Sleng (the infamous Khmer Rouge prison) and the Killing Fields just outside the city center. Anyone interested in understanding Cambodia should take time to visit at least one of these sites, as the Khmer Rouge era still defines many of Cambodia’s struggles today. Tuol Sleng is quite a harsh place to visit – a former school, it was turned into a detention center where supposed opponents to the regime were tortured for their confessions. The Killing Fields is equally sobering, but has become more of a memorial to the people who died there, rather than a museum. A very well written audio guide, put together by Youk Chhang (Director of the Documentation Center of Cambodia ), helps visitors move around the site and gives an insight into the lives of people who suffered at that time. A good way to end a challenging day visiting these sights is with a boat trip along the Tonle Sap at sunset. It’s possible to rent a whole boat to yourself, or sign up for a general boat tour. 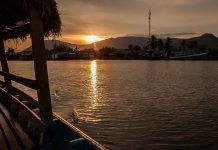 The boat trip will take you at a leisurely pace down the river to where the Tonle Sap merges with the Mekong. It’s a relaxing way to see Phnom Penh from a different perspective. Visitors might also like to have a quick stroll around the Olympic Stadium (Cambodia has never hosted an Olympics, but the stadium complex somehow landed this name) after 3pm. Scores of Phnom Penh residents gather there to join in outdoor aerobics classes, have impromptu football games, or just jog around the track. 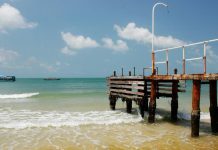 It’s a fun, relaxed, and a very Cambodian environment. Another popular sight with visitors who have a short time in Phnom Penh is the Royal Palace, including the Silver Pagoda. Originally built in the 19th century, many buildings in the complex have been reconstructed over the years, but still the overall site is impressive. The Silver Pagoda isn’t actually made of silver, but rather part of its interior is lined with silver tiles. Only a small part of this is actually visible (the rest is covered for protection) but another key attraction is on display – Cambodia’s Emerald Buddha. Phnom Penh is the most accessible city in the country. Phnom Penh airport is well serviced by a variety of airlines, and only a 20 minute tuk tuk ride out of the city center. There are regular buses to and from all the other main destinations in Cambodia, as well as out to Vietnam, Laos and Thailand. Getting around in Phnom Penh can be a little more challenging than in other Cambodian cities due to the volume of traffic. There are plenty of tuk tuks to be found, but visitors might have to take a deep breath as drivers cut across rows of oncoming traffic, or blithely drive the wrong way into the traffic until they find a gap to get to the other side. It is not recommended to ride a motorbike or bicycle in Phnom Penh until you feel confident with the traffic and street layout. You can expect the same weather in Phnom Penh as elsewhere in Cambodia – either hot and wet, or hot and dry. As with many capitals, the population density tends to make it feel warmer than the provinces, and a room with air conditioning can be a welcome respite from the heat and noise of the city. If visiting in rainy season, make sure to pack sight-seeing into the first part of the day. Mornings tend to be clearer, with rains coming in the afternoon and evening. Phnom Penh may not have the splendour of the Angkor temples nearby, nor the attraction of coastal waters, or the adventure of the eastern jungles, but visitors to Cambodia still feel the pull to stay longer when they are there. Refreshingly small in size in comparison to most Asian capitals, it is a fun, friendly place to explore, with a mix of difficult history and optimistic development.